Ca 1920, paulownia, cedar or cypress, iron fittings. This chest with wooden locking bar in front is known in Japan as a “Mikuni bo” dansu because the type originated in Mikuni region of Fukui Prefecture. Merchant chests were made for export during the late 19th-20th century. This chest is made from paulownia wood, characterized by its straight grain pattern. This wood was widely sought after as construction material for making storage chests in Japan, Korea and China because it has the property of adjusting to changing weather well and is naturally light, making it easy to move around, especially if there is a fire or earthquake, a constant hazard in the old country. The interior of the chest is made of cedar or cypress, a wood resistant to insect damage. The chest has a medium size drawer at the top with a small compartment with a lockable door alongside it to store small valuable personal items. Below this level are three full size drawers to store clothing. These three levels of long drawers are spanned vertically by a wood slat overlaid with a decorative iron bar that could lock the drawers together and at the same time provide an attractive covering for the wide span of the middle part of the drawers.. 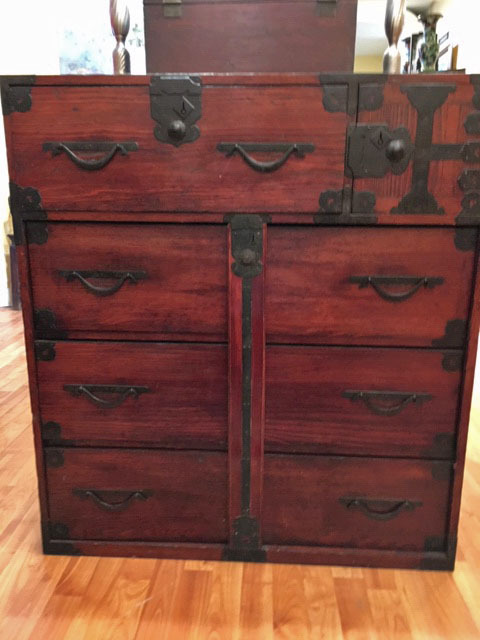 The original reddish lacquer color contrasts beautifully with the black wrought iron lock-plates and the warabite iron pulls on this chest. The piece survived in good condition, showing just small wear and tear from having been uaed and aging. The metalwork is original, and the chrysanthemum-shaped locks still close but cannot be locked because the key is missing.